Health care benefits will be taken away from more than 22,600 coal miners and their families in just a few days. U.S. Senator Mitch McConnell has the power to see that this doesn't happen. And McConnell also can do what he has repeatedly failed to do for years – get a permanent fix for miners' health care AND pension programs. He balks at what he knows is the right thing to do because many of those who would benefit are union miners. McConnell is under increasing pressure to allow the Miners Protection Act to pass the Senate to create the permanent fixes that are needed. But Congress has to act now. Our calls could make the difference. Call Senator McConnell's office in Washington DC at 202-224-2541. If you fail to get through try one of his field offices. MESSAGE: Congress must keep the promise to coal miners. 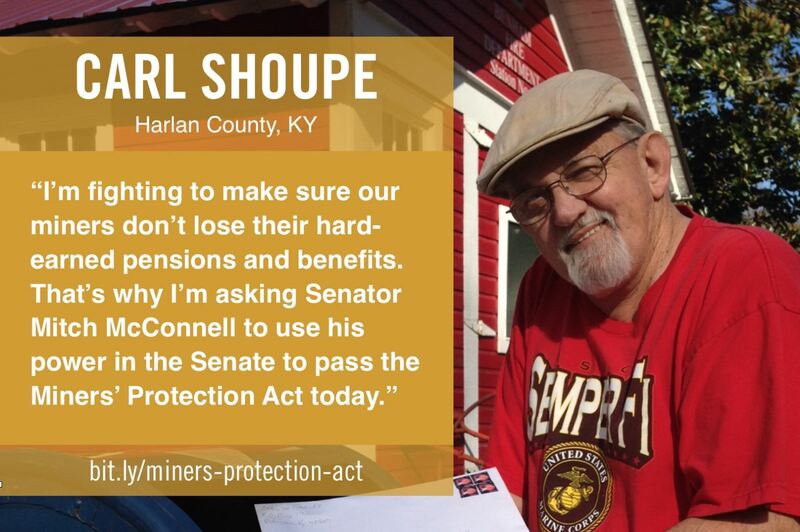 Pass the Miners Protection Act with a permanent fix for both the health care AND pension benefits. NOTE: make sure you emphasize "and pension" as McConnell has shown a tendency to deal with health care only and ignore the pension crisis. There are several reasons health care and pension programs for retired coal miners are in trouble. One of them is that when coal companies declare bankruptcy, as they have been doing, the court allows them to default on their obligations to coal miners. That has forced the federal government to step in with short-term fixes that protect the health care and pensions for miners that these companies are refusing to pay. The federal government also is obligated to do so based on a 1946 agreement that promised pensions and health care to union miners with 20 or more years experience. In December, Congress passed another short-term fix as part of its continuing budget resolution. That expires at the end of this week – and McConnell made sure the December action dealt with health care only and not pensions. Miners got letters in March saying their health care benefits would end after April. This is no way to treat coal miners and their families. It's time to end this uncertainty. Congress can pass a permanent fix for miners health care AND pension by passing the Miners Protection Act this week. Or Congress can incorporate the language of this legislation into another continuing budget resolution that it must pass this week to avoid a partial government shutdown. ACTION #2: If you're able to make an additional call, contact your representative in Congress with the same message as above, with the addition of asking them to put pressure on House Speaker Paul Ryan to support permanent fixes for miners' health care and pensions.